The judging has taken place and the results checked and verified. Available in PDF format for downloading. If you attended this years show you can leave Feedback on a secure form. Set of Digital Images. Between 12 and 24 in number to illustrate “At the Hive Entrance” in a form suitable for a lecture. The images must be in ‘jpeg’ format at an appropriate resolution in an electronic format suitable for use on a domestic computer system. The set must be accompanied by an appropriate commentary which can be either a written or typed/printed script. Power Point (or other) integrated ‘presentations’ are NOT permit- ted. Please state the number of images in the set on your entry form. First: £25; Second: £20; Third: £15. 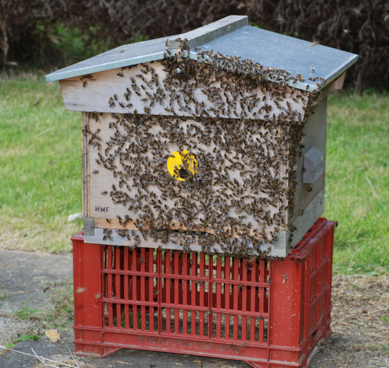 (Sponsor: The British Beekeepers’ Association). The subject for 2017 is “Brood Diseases”. "Good ideas but lacking detail". 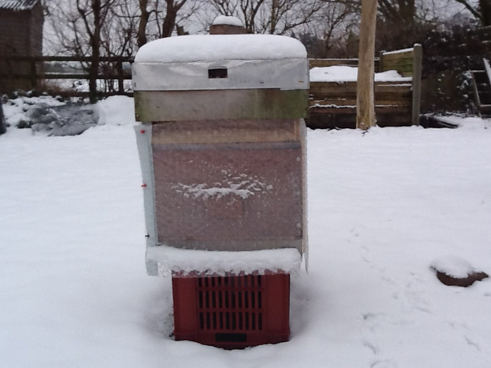 Winter can be a difficult time for the bees, particularly when there is a heavy snowfall. The snow at the entrance can present a problem if it blocks it, so care should be taken to clear it away. 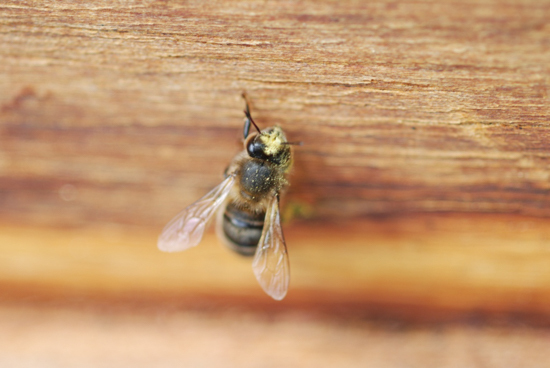 On sunny days, when there is snow on the ground, the bees can become disoriented by the brightness of the sun on the snow and go down towards the snow, rather than up towards the sun, so risk getting stuck in the cold snow and perishing. Clearing away the snow will help if this is possible. 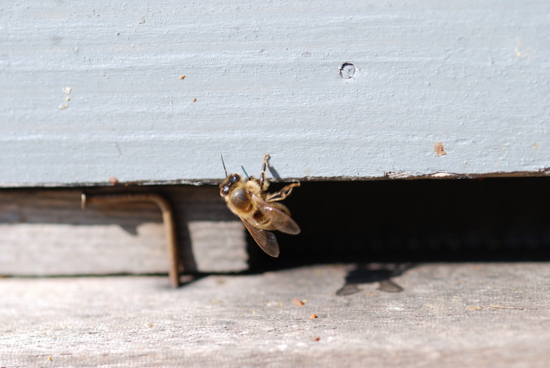 On winter days when the sun is on the entrance of the hive, you will occasionally see a bee venture out on a cleansing flight. 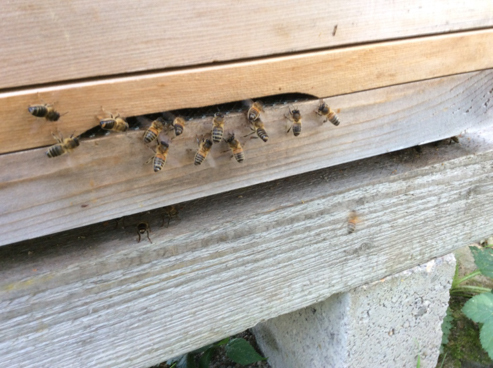 As the weather warms up, a pleasing sight of the bees starting to increase their activity and come in with pollen, a good sign that all is well inside the hive. 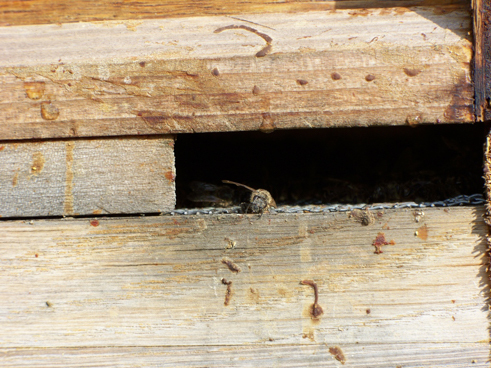 This however is not a sight you want to see, dead bees at the entrance of the hive is never a good sign, this colony has clearly been in some distress, evidence of dysentery at the front of the hive indicates the hive is very sick. 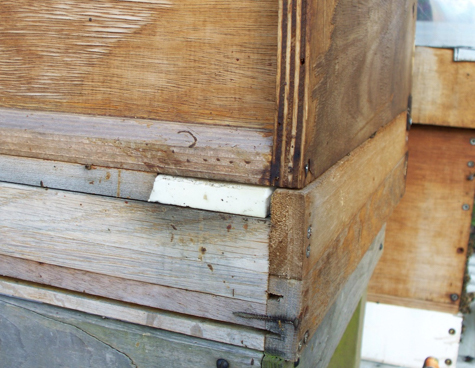 Closer inspection showed this colony had perished and the safest short term solution is to close it up to prevent robbing and disease being passed to other colonies until the hive can be cleaned properly. 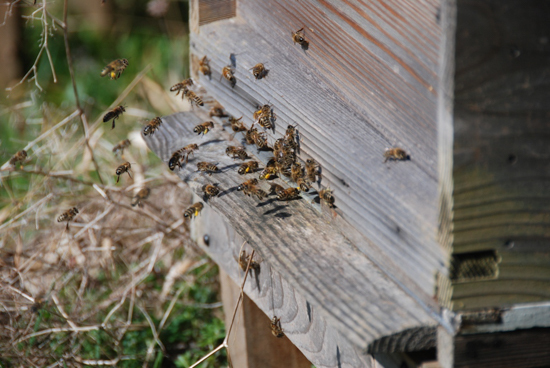 Pollen loads are what holds most people’s attention when they are looking at the entrance to the hive. Many colours and sizes of loads. 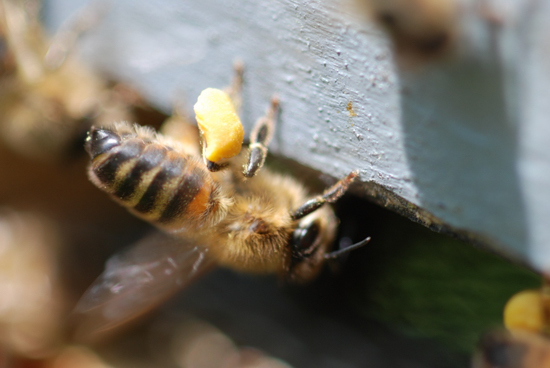 Sometimes, bees come back with pollen on their head or thorax that they can’t reach to clean off with their legs, so they arrive back at the hive with a stripe on them. The hive entrance sometimes looks like chaos, but there is information exchange going on, with some food sharing to show others what to collect. 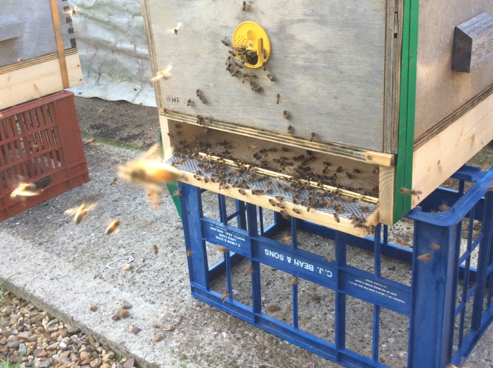 Sometimes – there just isn’t enough room for the bees to get in and out without having to queue – some try to jump the queue! 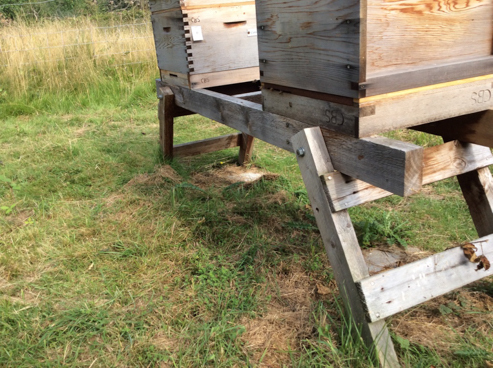 Shows bees at the entrance because they have been shaken onto new foundation as part of a spring clean of the hive. 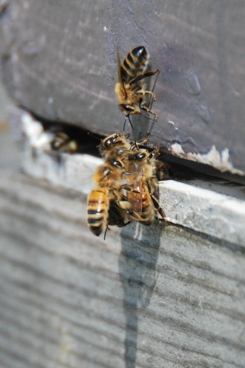 Here the bees are returning back to the hive, they had tried to swarm, but as the queen was clipped, she couldn’t go with them, so they returned, in a somewhat straggly way! A swarm? 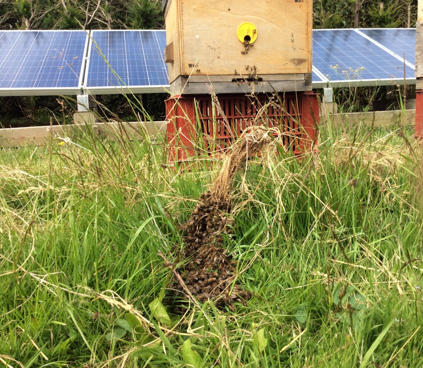 No, they don’t like the smell of the thymol varroa treatment so have come out to escape it. 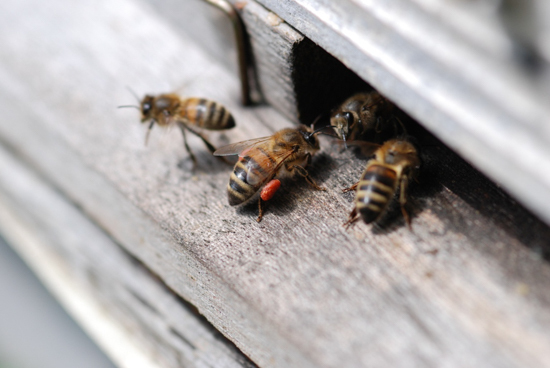 When many bees have left the hive, for whatever reason, some of the bees stand at the front of the hive, expose their Nasenov gland and fan the scent, to let the other know where home is. 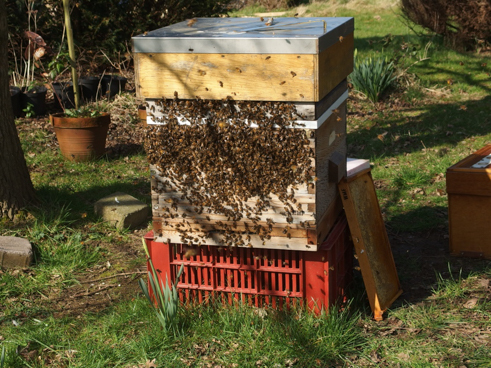 It is a good idea to stand hives on a surface than be cleaned, such as a concrete base, otherwise grass can grow and restrict access to the entrance, so if the hives are stood on grass, they should be raised well off the ground and the grass kept wee mown. 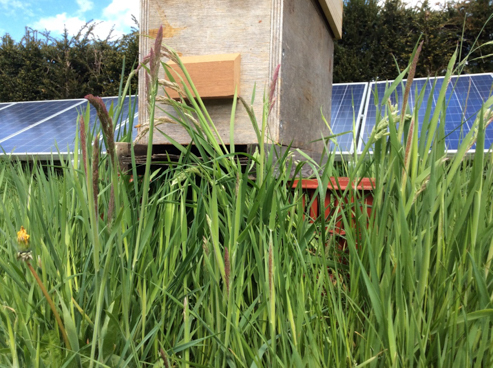 When the hive is sited on grass, always look around before trampling on it, here the bees had tried to swarm, but because the queen was clipped, she could only walk out onto the grass, so a few feet in front of the hive she was surrounded by a small cluster of bees. 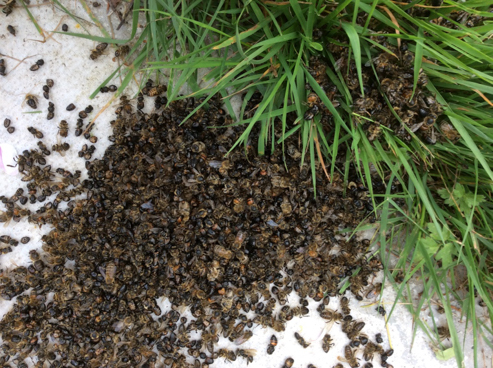 These images show the importance of hard standing at the hive entrance, both have a lot of dead bees, but image 19 shows that a samples of bees can easily be collected for analysis and examination, where the bees on the grass is much more difficult. 19 is likely to be pesticide poisoning many bees at the entrance like this is very disturbing and should always be investigated. 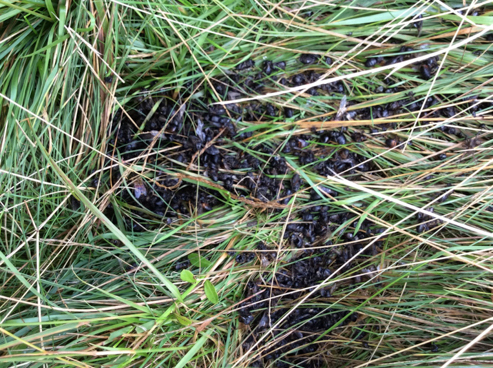 It is possible that these have been poisoned, but also they may have been caught in a sudden heavy shower of rain, or it could be drones being thrown out at the end of the season. Sometimes, you can see od pieces of equipment at the entrance to the hive. This is a pollen trap. 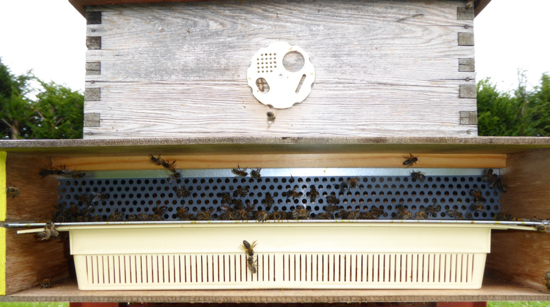 A grid is put at the entrance, that the bees have to walk through, the grid brushes the pollen off their legs, which falls through a screen into a collecting tray. 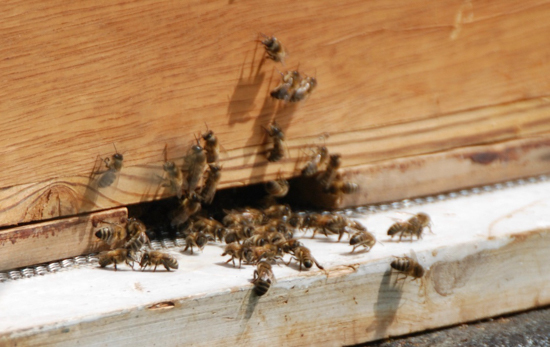 If bees have been moved, when the entrance is opened, they often pour out and start their orientation flights. Don’t stand watching for too long as they will think you are a landmark they can use! We started in winter with snow, so now we are ending with autumn. Watch out for pests. 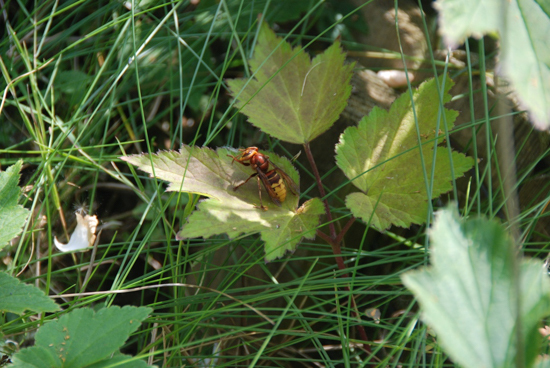 Hornets and particularly wasps are a real nuisance and can wipe out weak colonies. 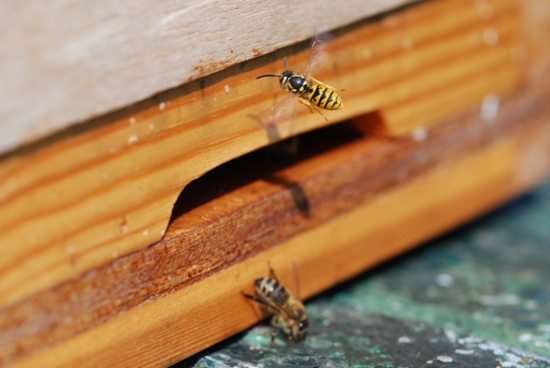 Keep the entrances as small as one bee space if wasps have found your hive. 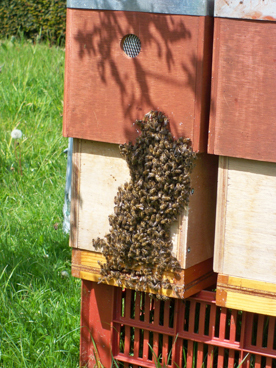 Video, CD or DVD on a Beekeeping Subject. VHS, CD or DVD format. Duration 10 to 15 minutes. To be judged on its production quality and interest. First: £25, Second: £20; Third: £15. 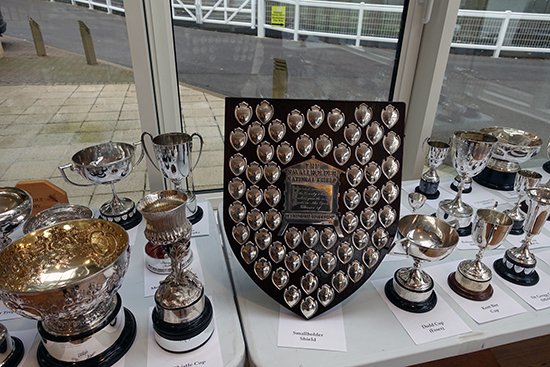 (Sponsor: Guildford Division, Surrey BKA who will receive a copy of the winning entry for local use). View on our YouTube Channel. "A really good effort. Lots of useful content and visual demonstration. It was let down though by the lack of a proper microphone, as sound is so important in videos. The pop-up inserts were clever. We could have done with more close-up cutaways, which also help with edits. The caption music was a bit clunky, as it was somewhat louder than the commentary. As a result, I can’t quite give it the ‘first’ that it would otherwise deserve. But it is a very good second!" 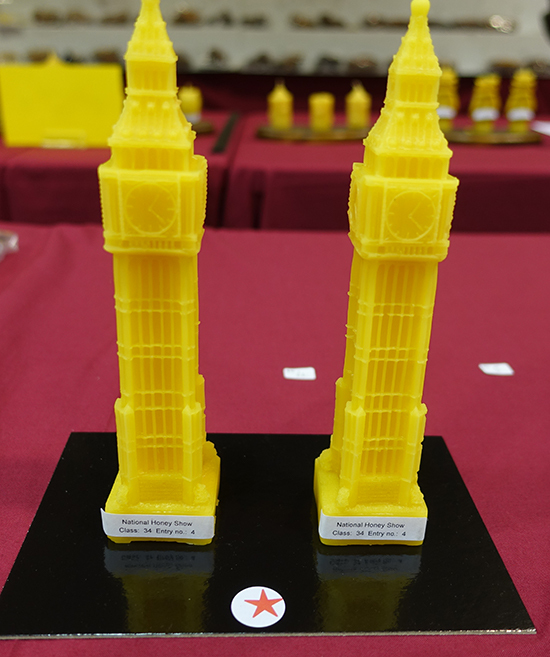 Two Beeswax Models, moulded, matching in all respects. First: £10; Second: £7; Third: £5. Please state space required on entry form. 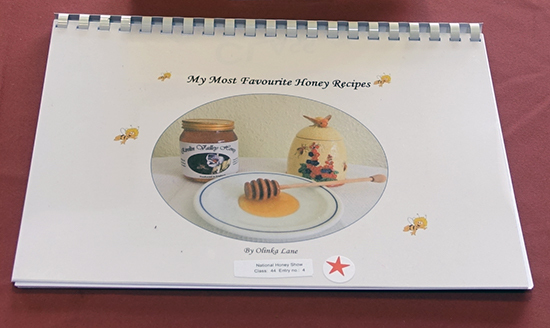 HELP us find this missing/stolen entry which was taken on Thursday 27/10/2016 between 15:32-17:30 it won 1st prize in class 44 "My Most Favourite Honey Recipes". 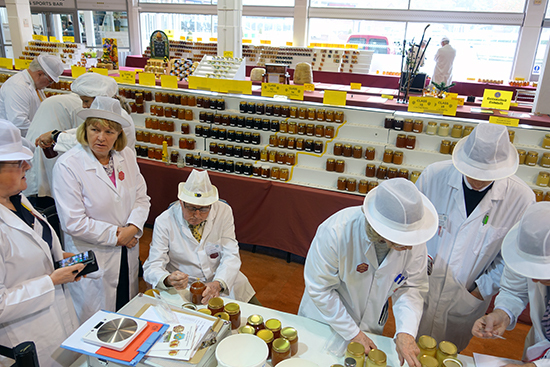 All the photographs taken at the 2016 National Honey Show as seen on our Slide Shows are available on Dropbox for publicity use in beekeeping newsletters, websites, magazines articles and the general press. Download or add to your own Dropbox account.